All linen and towels are supplied; initial supplies of soap, toilet paper, tissues, coffee, tea, sugar and milk are also provided. Outside there are 3 portable barbecues, entertainment decks, an expansive lawn area for cricket, pole tennis, and other ball games, a guest laundry, and off-street parking. For the younger children there is a sand pit and the garden is fully enclosed. While you're here why not enjoy use of our cedar spa, free of charge to our guests? Our spa suite consists of King bed that can be split to singles, Television, DVD player, DVD's, books, kitchenette with refrigerator and microwave, Dining setting for four, Fully air conditioned, Large covered deck with outdoor setting and preferential use of cedar spa. Open plan kitchen, fully fitted with refrigerator and microwave, coffee plunger, teapot. Fully fenced garden with pole tennis, cricket and a great sandpit for the kids, young and old Living and dining for six with polished floor boards. Modern bathroom Entertainment deck with BBQ and expansive lawn area, ideal for families. 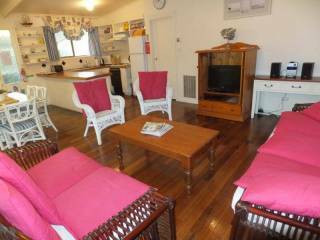 Living area with TV, DVD, CD player, reverse cycle air conditioning, DVD's, CD's, books, games Fresh flowers Wireless broadband. Each apartment has 2 bedrooms accommodating 6 guests, with built in robes Apartments 2, 3 & 4 have king splits & 2 twin bunk beds. Portacot available, all linen supplied Initial supplies of tissues, toilet paper, tea, coffee, milk, sugar, fly spray, laundry detergent, dishwashing liquid, air freshener, Guest laundry. 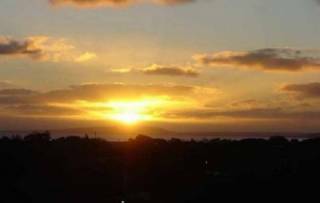 Beach Holiday Apartments are located in picturesque Rye Beach on the Mornington Peninsula. Our spa suite offers guests exclusive use of the private outdoor cedar hot tub/spa located on the timber deck terrace, the spa suite also has twin split system heating/cooling and a kitchenette, allocated 'spa suite' car space and WiFi come standard. use of the onsite laundry is also included. There is an expansive lawn area, outdoor furniture and three communal barbecues. Each has a dining setting for 6 with crockery, cutlery and glasses and split system heating and cooling. Outside there are three communal barbecues, entertainment decks, an expansive lawn area for outdoor dining with picnic tables, cricket and other ball games. For the younger children there is a sand pit and the garden is fully enclosed. expansive lawn area for cricket, pole tennis, and other ball games, plus a guest laundry and off-street parking. For the younger children there is a sand pit and the garden is fully enclosed. Location for: 22 Dundas Street, Rye, VIC 3941. If cancel, modified or in case of no-show, the total price of the reservation will be charged. The total price of the reservation may be charged anytime after the booking. Please contact us on the telephone number provided in your confirmation email to receive key codes and confirm your check-in instructions.